Now that September is upon us, we have to start thinking about those fall holidays. Before you can say "BOO, " we'll be carving pumpkins and cutie pie Trick or Treaters will be ringing our doorbells on Halloween. 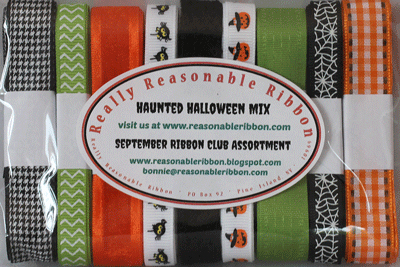 Really Reasonable Ribbon has a great Haunted Halloween Mix in the Ribbon Club Collection this month, and as soon as I saw it, I knew I wanted to pair these fabby ribbons up with Carta Bella's Trick or Treat paper collection. 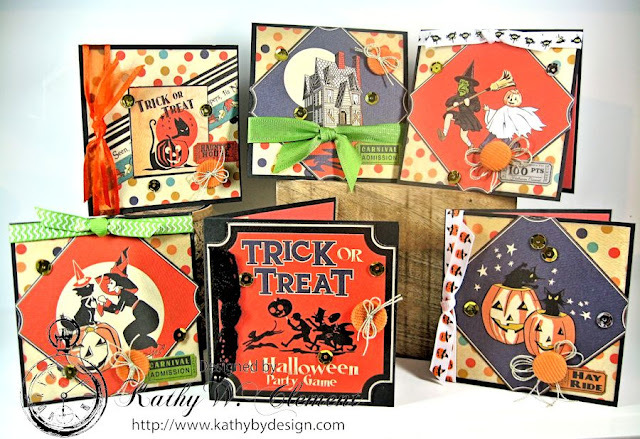 This is a cute altered box filled with Halloween cards. My black border was created with Gladys Black Crochet Lace. Doesn't it look like a spider web? Gotta love that!. It adds great texture to the box cover, too! My beautiful triple bow is made with silky soft Houndstooth Black Plaid Ribbon. This ribbon is fabulous to work with: soft, supple and easy to tie, especially with my Zutter Bow-it-All. I topped it with an orange burlap string loopy bow. That's a sparkly bat charm on top of the bow, and an orange foil rosette. I punched the numbers from the paper collection and then hit them with a little Diamond Stickles, then added teeny tiny sequins to make them shimmer. I used the spook-tacular Spider Webs on Black Grosgrain Ribbon to create a border on the bottom of the box. I layered this same ribbon over Orange Sheer Organza with Satin Edges. I love the way this makes those spider webs POP. I added a brad to a triple layer of scallop punched circles that I ran through an embossing folder to decorate the front of the lid. 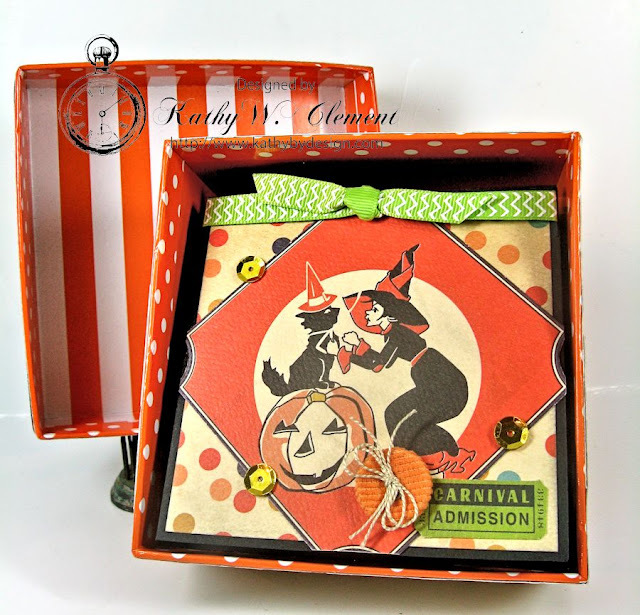 The inside of the box is filled with 6 simple 4" square cards, each decorated with Trick or Treat papers, sequins a button and a touch of ribbon from the September Ribbon Club Collection. I love the retro feel of this paper, don't you? Here's a peeky at all six cards. Wouldn't these make great party invites? Or, you could set up a photo booth at your Halloween party, and then put the photo inside the card when you mail your thank you notes. You could even clip them onto some ribbon or twine and use them as a banner. Here's another photo with one of the cards open. I finished each card the same way on the inside. Sweet and simple! 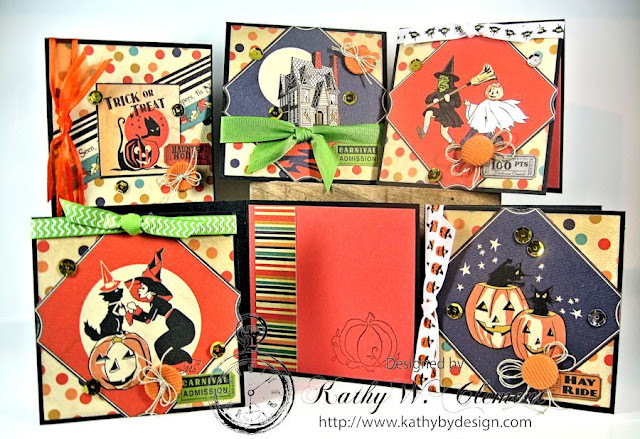 And, if you haven't seen it yet, here's a look at the fabulous Haunted Halloween Mix in the September Ribbon Collection. If you've always wanted to join the ribbon club, now is a great time because Really Reasonable Ribbon is having a special offer for new Domestic Ribbon Club Members. Join this month, and you get both the Haunted Halloween Mix and the Autumn Days Mix for just $17. That's a whole lotta fall fun right there! You can find all the details on this special offer HERE.